Hello and happy Wednesday to everyone! Hope you’re all having a great week. It’s Tonya popping in today to share another fun card with Dare 2B Artzy using the ever-adorable Retro Owl stamp. 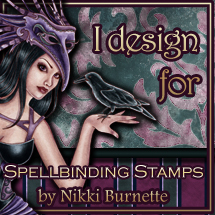 Have I mentioned how much I adore the owl line of stamps from D2BA? They are all so cute and fun to play and get creative with especially when you can get a bit retro with them too. For today’s project I used the leaf boarder that comes with the Retro Owl stamp and created my own background. To do this I used two different kinds of embossing powder. I stamped the first two leaf borders onto some Canson watercolor paper, using my MISTI and some Versamark ink for embossing. Then I sprinkled with some Ranger Verdigris colored embossing powder. This embossing powder has a unique blend of greenish-teal, black and gold in it so it sort of gets a turquoise finish. Next I stamped the leaves in the opposite direction with Versamark ink and sprinkled on some Charcoal embossing powder that has holographic elements in it. I really like the look of the contrasting colors. To add a bit of pizazz to it, I used my Gansi Tambi Starry Colors blue gold #901 watercolor and added some gold to the center of the open leaves. Once the background was finished and the watercolor was dried, I die cut the panel down using a cute scalloped frame die. For my sentiment, I used the Hello from the Retro Pattern stamp set and stamped it at a bit of an angle with some Versamark ink and then heat embossed with some black embossing powder. Next I added the Friend sentiment from the Retro Owl stamp set and embossed with some black embossing powder as well. Next, it was on to color up that super cute owl. I wanted to match the turquoise color on the owl so I used my Copics in G000, G00 and BG32 and BG13 for the front and wing and Black 100 and Y28 for the squares on the chest. Then I used my E41, E42, E43, E44 and E47colors for the body of the owl. I had one little area where my Copic marker blurbed (as I like to call it) – I nice blob of ink onto my owl because it was super juicy. EEK!! I was able to blend it out pretty well so it’s not too noticeable. I also added some softer peach-pink touches to the ears using YR01. I added some Spectrum noir sparkle in clear and black onyx to the front of the owl to carry over the sparkly themed background into my owl. With my owl completely colored, I was able to die cut it out using the matching die, D2 Owl Star Die that coordinates with my image. I was then able to add the cute little googly eyes to my owl and glued them in place. I created my card base from some 110lb cardstock and added a piece of teal-green cardstock horizontally across the card base for a pop of color that coordinates with my background. My background was layered on top of the card base using some dimensional foam to raise it up a bit from the card base. I added some dimensional foam to the back of my owl and added her to the center of the card. To finish the card, I added a few, matte dots to the upper left side of the card to add a bit more dimension and to balance the card out. Hope you enjoyed this cute retro owl card today! If you like owls, please check out the Dare 2B Artzy store online and see variety that’s available (plus the matching dies). They’re all super cute, it’s hard to decide sometimes. Make sure you’re checking the Dare 2B Artzy blog regularly as the DT will be sharing some fun new stuff in the next few weeks. You don’t want to miss all the great new stamps that are being released very soon…TRUST ME! You’re going to love it!! Also, for those of you that love the chance to win free stamps, check out the lovely Kendra’s Instagram page. In honor of her Birthday this week, she’s giving away a set of the Dare 2B Artzy Snowflake Wishes stamps on Friday. It’s that easy & the beautiful Snowflake Wishes stamp set could be yours! !